500 years ago, on October 31, 1517, Martin Luther posted his “blog” to the door of the local church. The words and concepts have since been shared millions of times, and began what is now called The Reformation. But are his rebellious writings still relevant? Times aren’t so different today. The printing press was breakthrough technology in Luther’s day, and just like the internet, offered mind-boggling opportunities to spread ideas. 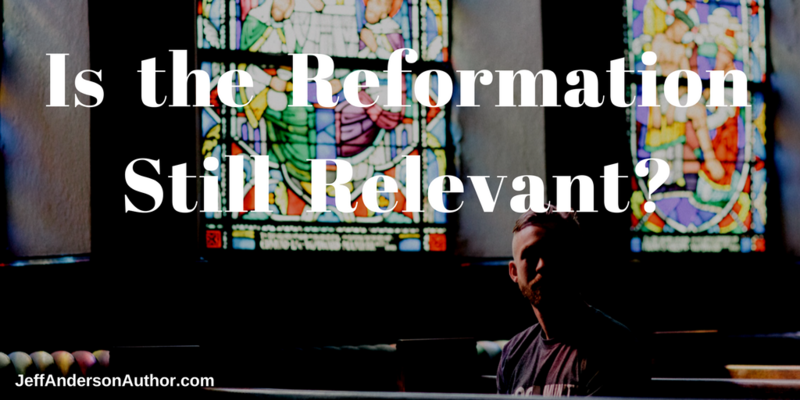 Here are five ways the Reformation is as relevant as ever. Read the Book of Acts and you’ll see the church was in serious need of “reformation” within a few years of Jesus resurrection. There were squabbles about doctrine, diets, and racism—and this won’t change as long as we’re on this earth. In Luther’s time, the Catholic church was (let’s be honest) unhinged in many ways. In hindsight, we see that the practice of asking for cash to secure God’s forgiveness of a loved one is twisted. But we have this clear view because we are “hinged” to some basic truths from the Bible. I’ll let you make your own judgement on the condition of the Western church today. Have we drifted at all from God’s hope for us? Probably. Will we continue to drift unless we desire personal reformation? Definitely. I’d argue that questioning culture—especially “church culture”—is vital for believers. Where would the church be without the Apostle Paul challenging Peter about his views on ethnicity? If they needed to continually check themselves, we certainly do. But what does “take heed” mean? I believe we can learn from Luther’s example here. Reformation is an attitude of humility and openness to the truth of God’s word. The church needed it since the first century, and we need it today. I’m the beneficiary of freedoms which come with access to technology. When the internet exploded, many people became fed up with the control the big banks had over the financial markets. I joined a group of renegade traders who set up their own offices and traded stocks. Suddenly, I was making a living in a way that was previously reserved for the chosen few. Sounds pretty un-amazing today, since you might even have an investment app on your phone, but in those days the shift was revolutionary. My financial health suddenly became my responsibility—not the responsibility of my employer or a stock broker. This is your faith. Own your faith by doing what Luther did. He went to the Bible. Let it teach you. Let it surprise you. Let it free you. Freedom brings disruption. And disruption, based on truth, is healthy. I didn’t say this change was comfortable, but we need it—especially when it comes to faith. I’m so tired of slogans and Tweet-theology, aren’t you? And I’m saddened by some of the words and actions of fellow Christians who seem unhinged from simple truths. Luther read the Bible, listened to church leaders, and was struck by stark differences. The vast majority of Christians 500 years ago had never read a single verse of scripture, and as a result were susceptible to deceit. Further debate, and continual reforms, have shown some of Martin Luther’s ideas to be pretty flawed. (And we know this because… we know the Bible!) But where would we be today of Luther, and others, hadn’t judged this insanity? In fact, the term “protestant” came from believers protesting what was clearly in need of judgement. I respect authority. And I challenge authority. We can do both. Luther did. Church leaders in the sixteenth century fought to keep the Bible out of the hands (and out of the native language) of the “common” people. Luther translated it into German and sparked a revolution of translation and distribution. But today we find ourselves in familiar place. The Bible is often kept from people, but in a very different way. In our society, the Bible is more accessible than ever. Meanwhile engagement with the text has steadily declined in the past decades. But why? One reason is the amount of cultural and technological noise—in everyday life and even in the church. Why read an ancient, outdated, book (the Bible) when fresh online revelation is available—every thirty seconds! One of Luther’s ninety-five theses stressed reliance on scripture, and not social-media feeds from church elite. The voice of church leaders is essential, but only when it’s secondary, and linked, to the Bible. Just like the printing press in Luther’s day, technology can be used to control hearts and minds, or spur reflection and reformation. We can choose. The key idea of the Reformation, which began in 1517 and took decades to impact the doctrinal delusion of the time, was a simple belief that the Bible, not tradition and opinion, should be the primary source of spiritual authority. In 1519, Luther preached “a simple layman armed with the Scriptures” should be more respected than pope and councils without them. This, as you might imagine, didn’t go over well with influencers of the day. Disruption, based on the Bible, sometimes brings peace, and sometimes brings controversy. But it always helps. Martin Luther wasn’t perfect. But he took thoughtful, prayerful, bold action—and kept speaking out because reformation takes time. As you read the Bible, do what Luther did: question yourself, and question culture—including church culture. You know that feeling when you know your church, your friends, or community have drifted from truth? Do something about it. You know that feeling in your gut when you know something’s wrong in your relationship with God, or your relationship with another person? Listen to that voice and do something about it. Treasure your Bible and read it. (Did you know countless believers were murdered in their selfless quest to bring those words to us in our language?) Talk about the Bible with your family and friends. Let it disrupt your thoughts, conversations, and actions. And watch reform spread.